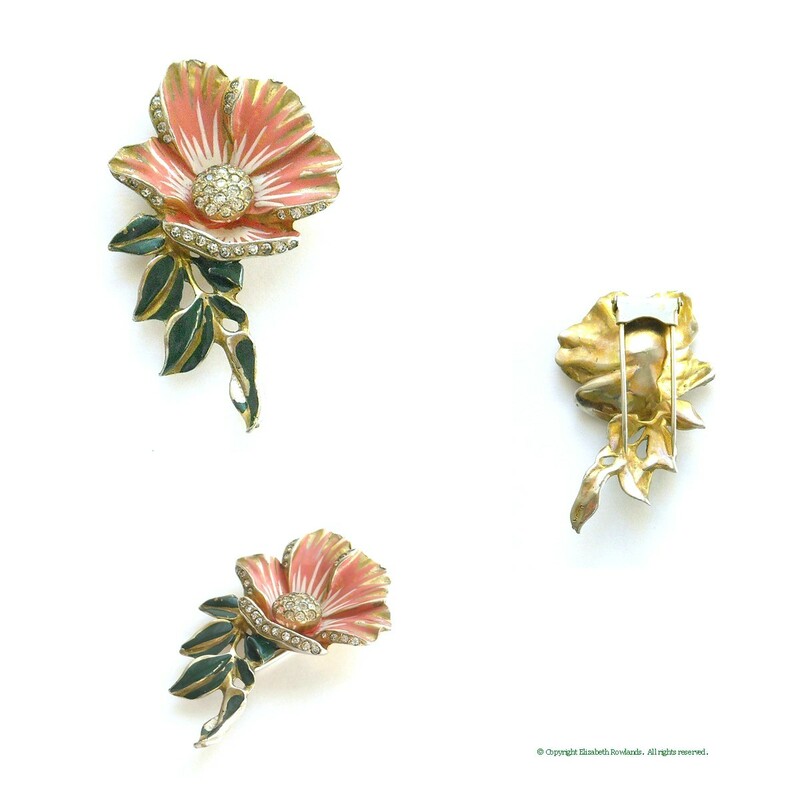 Begun in 1939 by founder Solomon Finkelstein, Déja Costume Jewelry, Inc. is known for graceful designs and lovely enameled floral pieces. 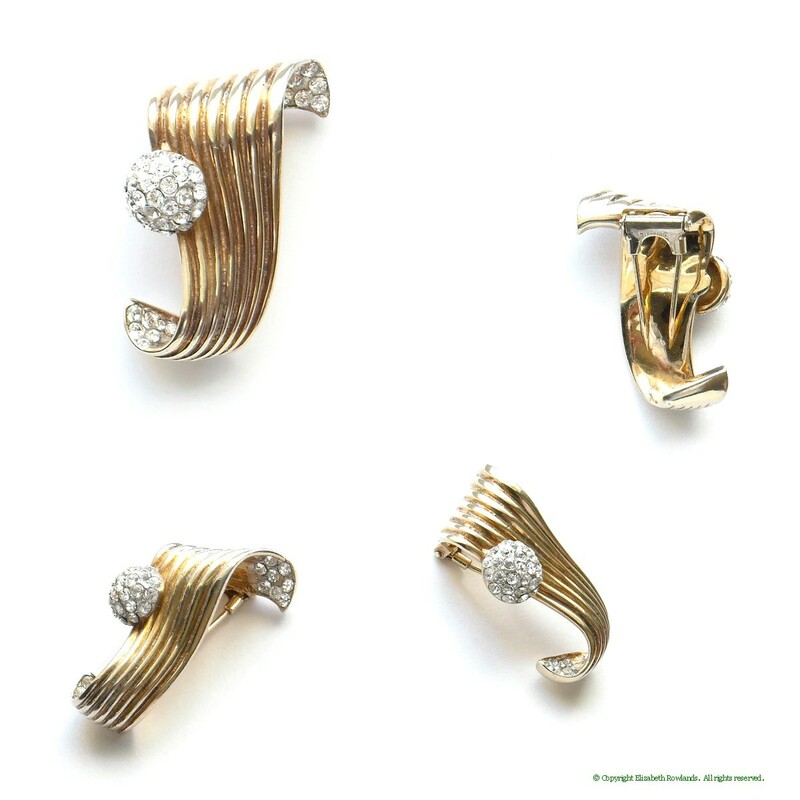 After a lawsuit instituted by DuJay, the company name was changed in 1941 to Réja. 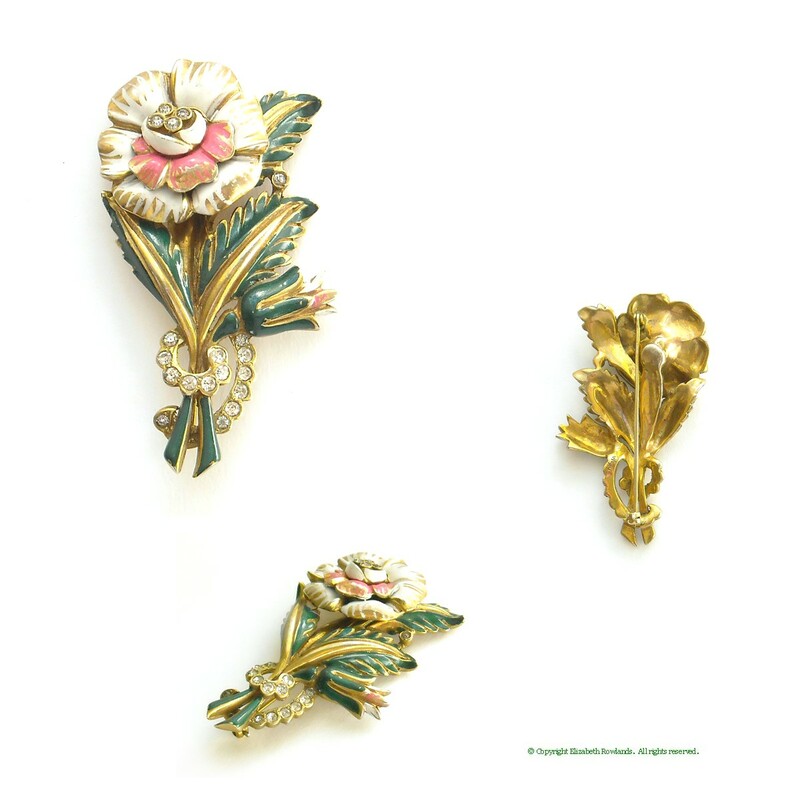 Pieces prior to 1948 were of better quality than later pieces, and production ceased in 1953. 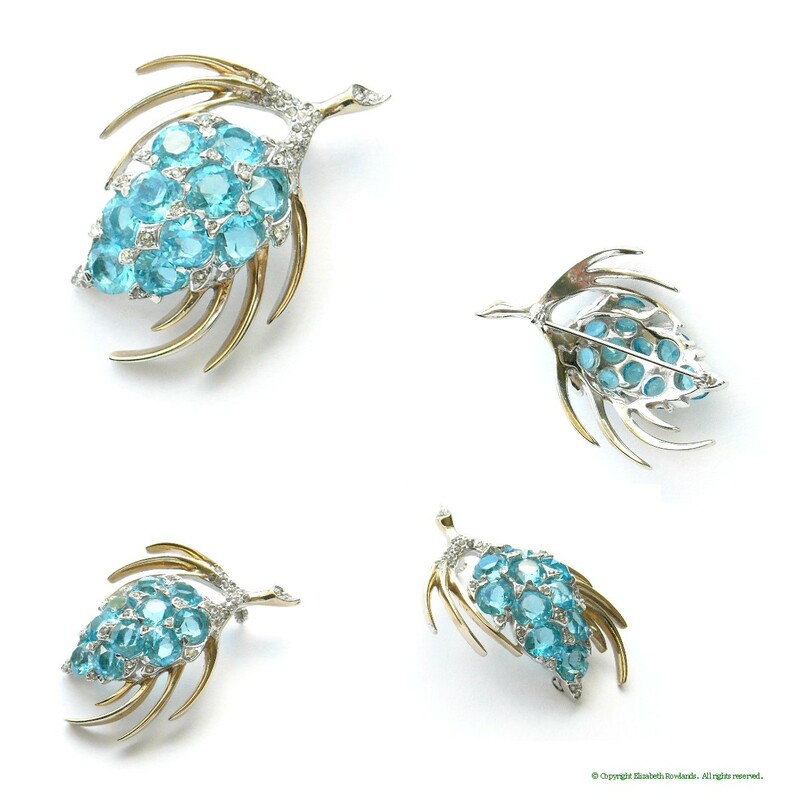 Brooch: 2⅛ by 2"; Earrings: 1⅛ by ⅝"
Luminous open-backed aqua stones stud this lovely brooch depicting a pinecone. 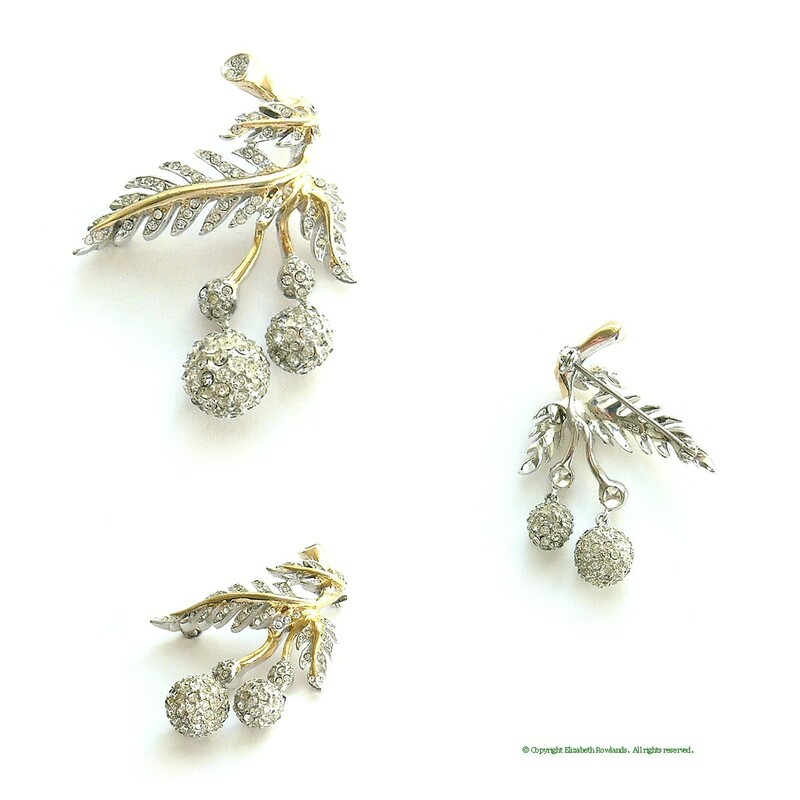 The branch and needles are gold plated with pavé rhinestones and the back is rhodium plated. 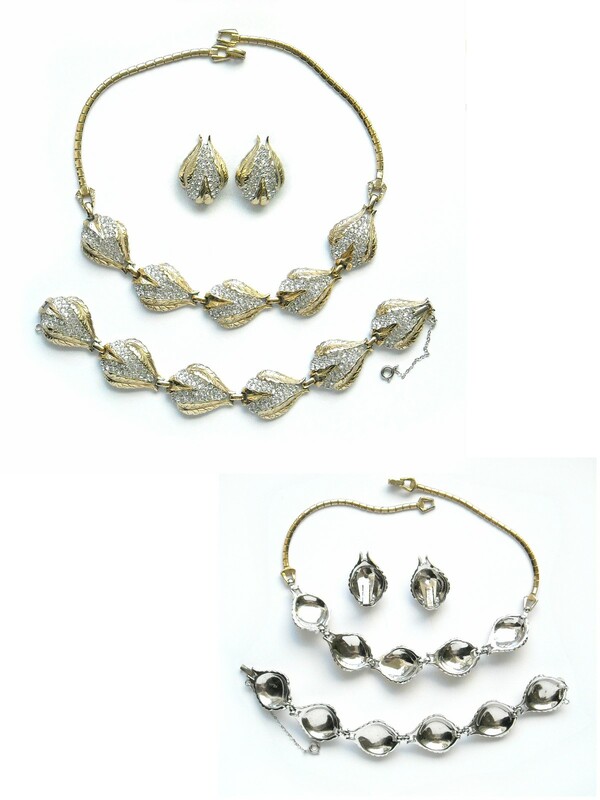 Marked: Reja Inc.
Necklace: 15" long, ¾" wide; Earrings: 1¼ by ¾"
Lacy openwork provides the texture and body for this glorious leaf brooch. 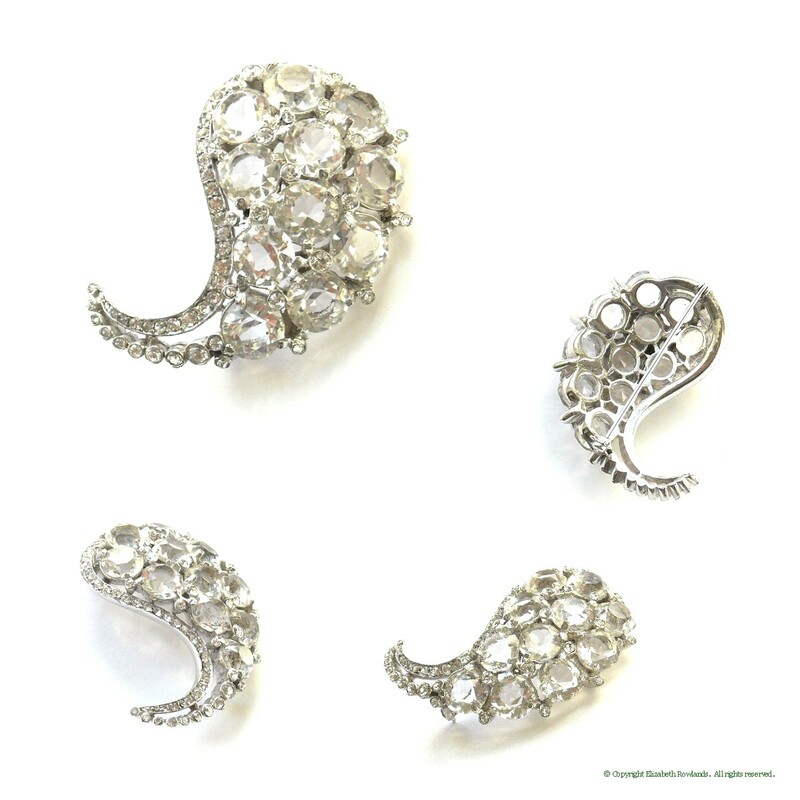 The dimensional curling edges and twisting center are enhanced with tiny rhinestones. Ca. 1948; minor wear to finish on the back. 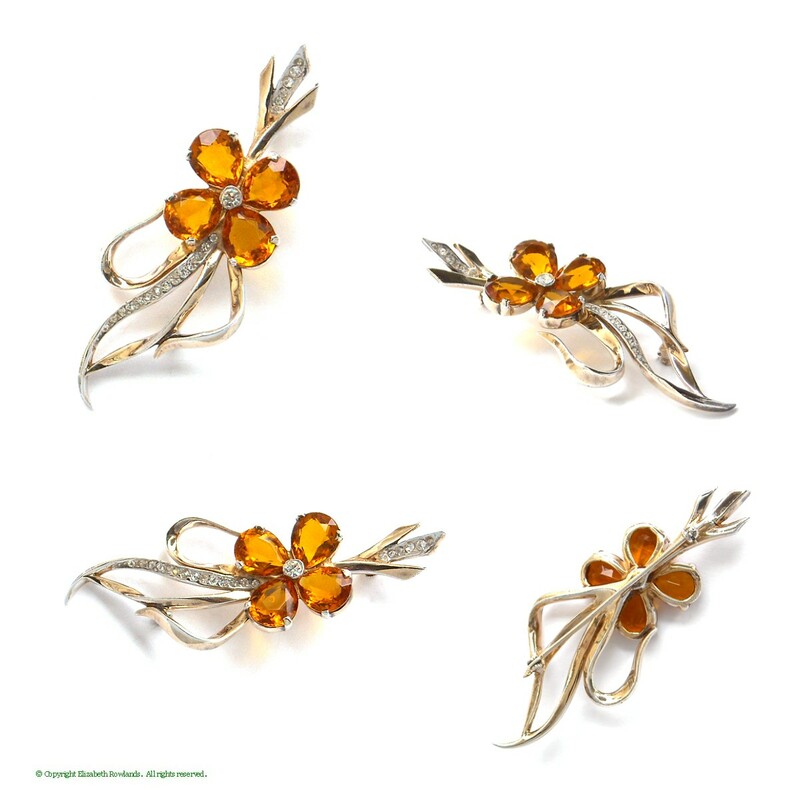 Marked: Reja Inc.
Lyrical in design, this 1940's floral brooch features ribbons and a flower with large amber pear shaped rhinestone petals. 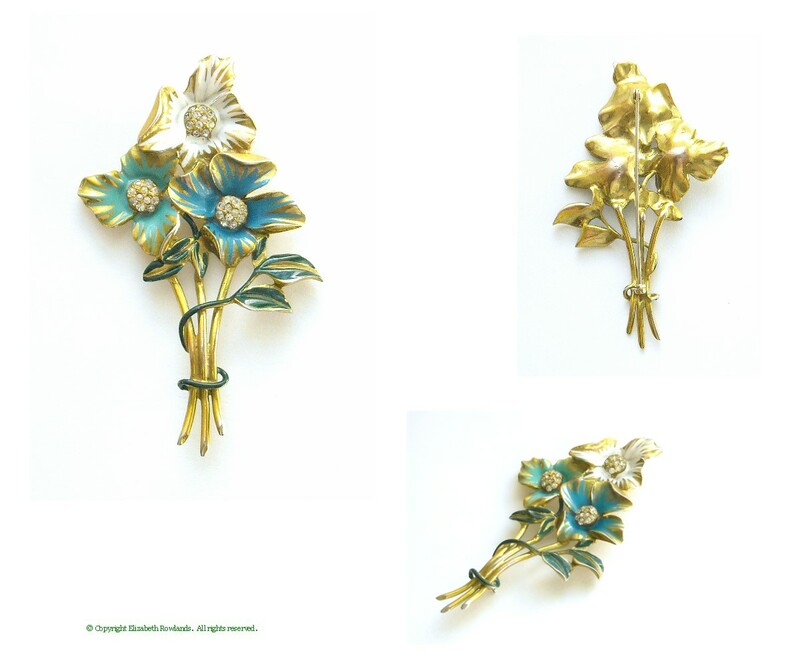 Exceptional condition; gold plated. 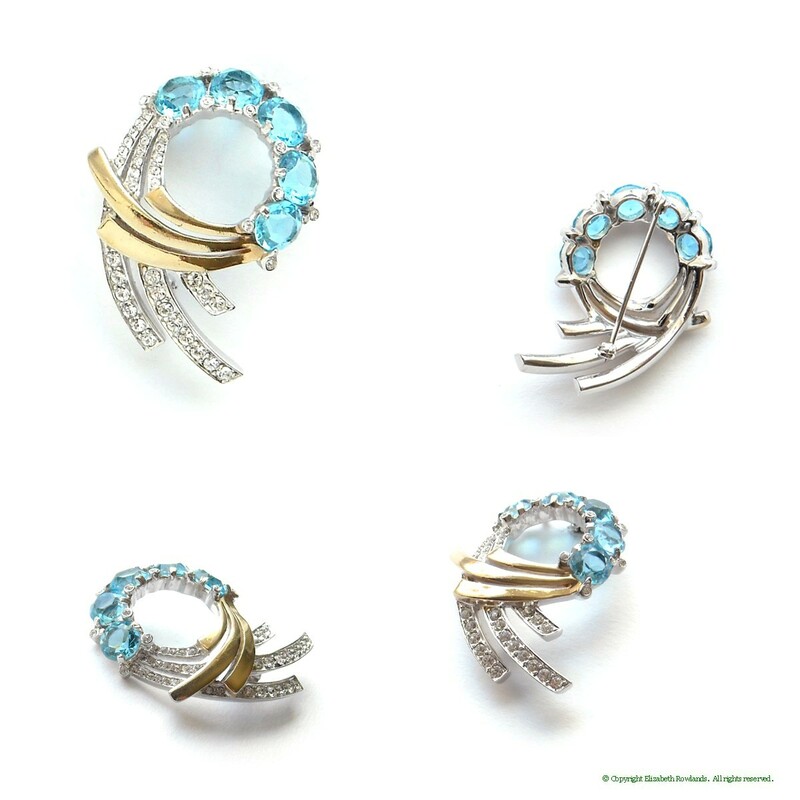 One of the fun things about this design, beyond its real look, is the transparency of the stones, giving the pieces a different feel according to the color worn beneath. 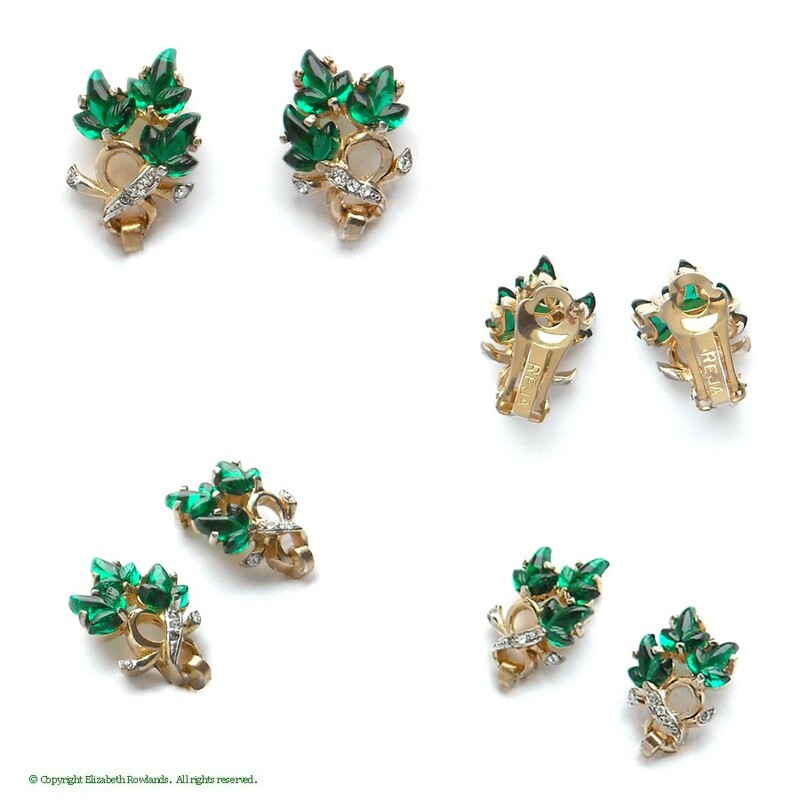 Excellent condition; clip earrings. Unmarked, but unmistakably Reja. 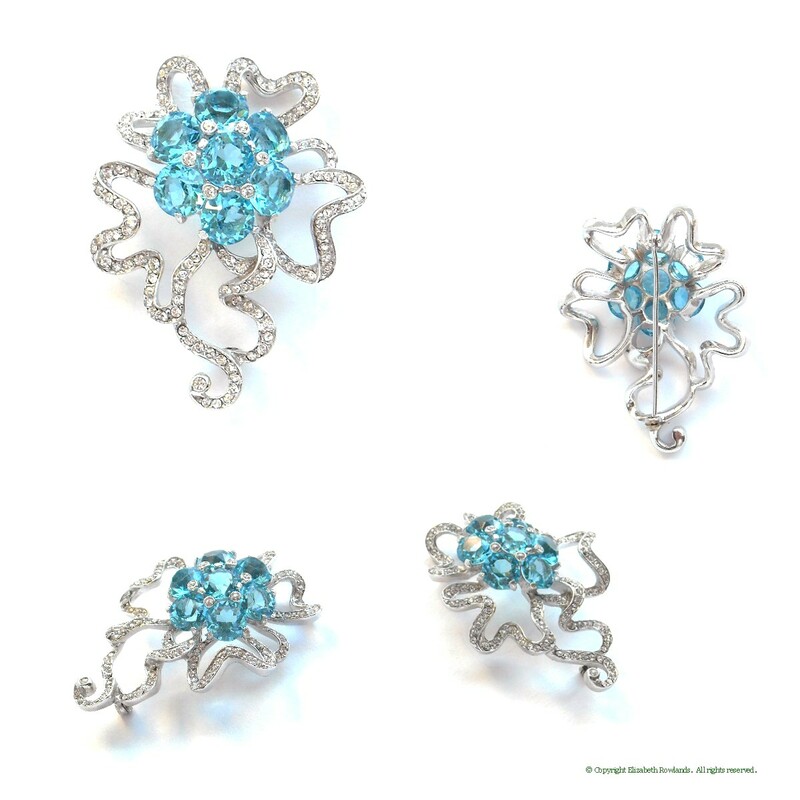 Necklace: 15 by ¾"; Bracelet: 7 by ¾"; Earrings: ¾ by ¾"
Both dynamic and graceful, this sparkling brooch resembles a nosegay of aqua rhinestone 'flowers' gathered up in rhinestone covered ribbons. 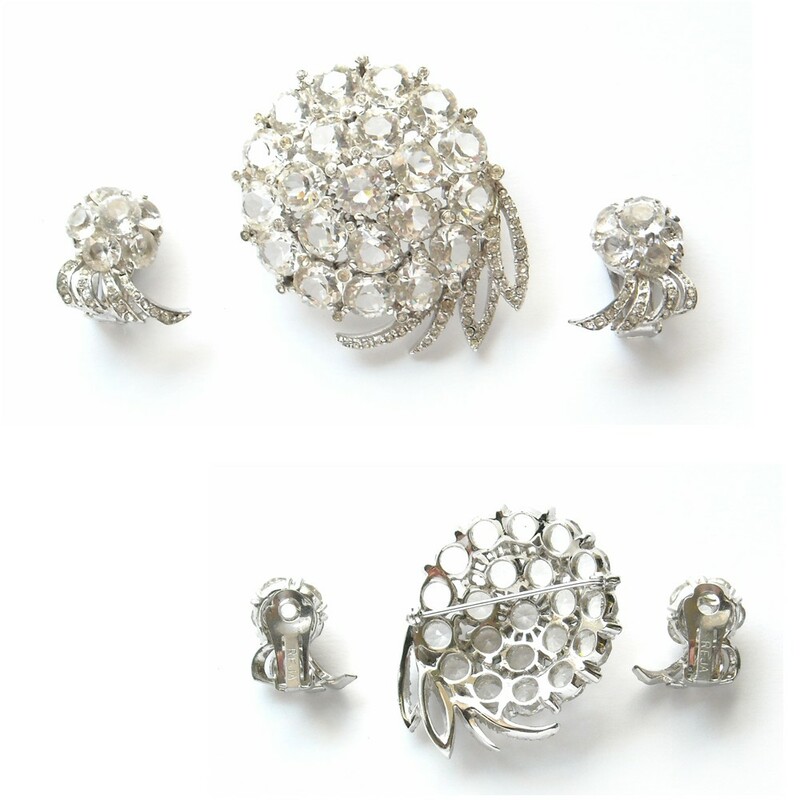 Exceptional condition; rhodium plating. Marked: Reja Inc. 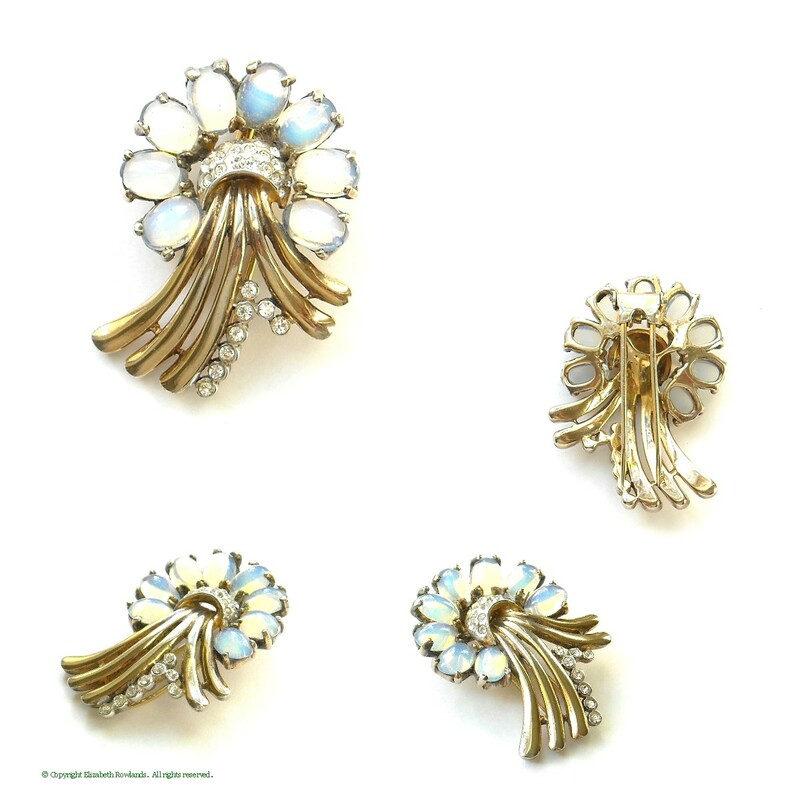 This goldtone and rhinestone brooch has a voluptuous design with a Moorish influence. 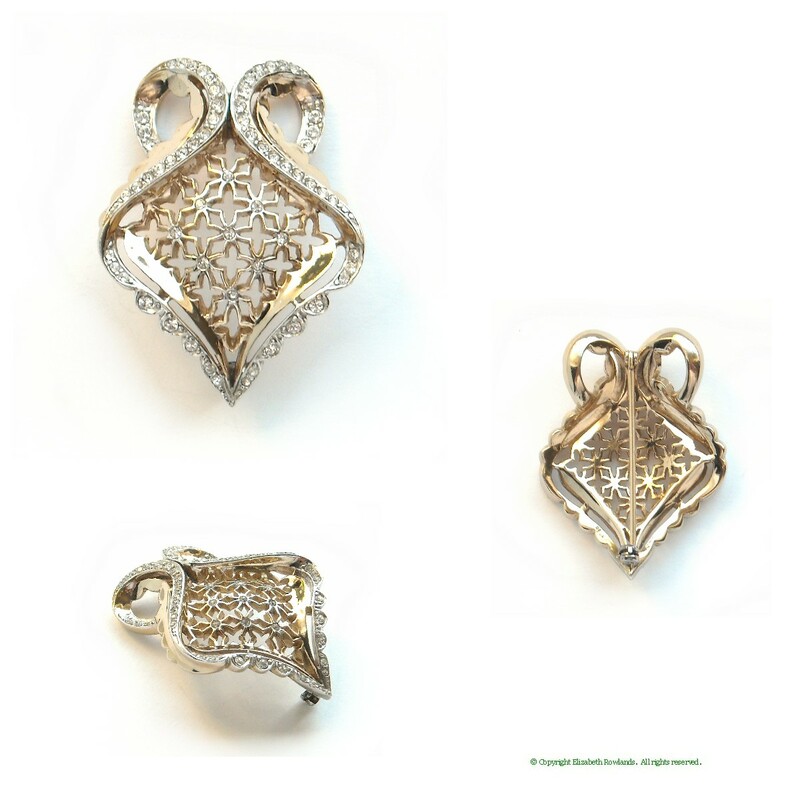 The open central portion resembles a screen with a quatrefoil pattern. 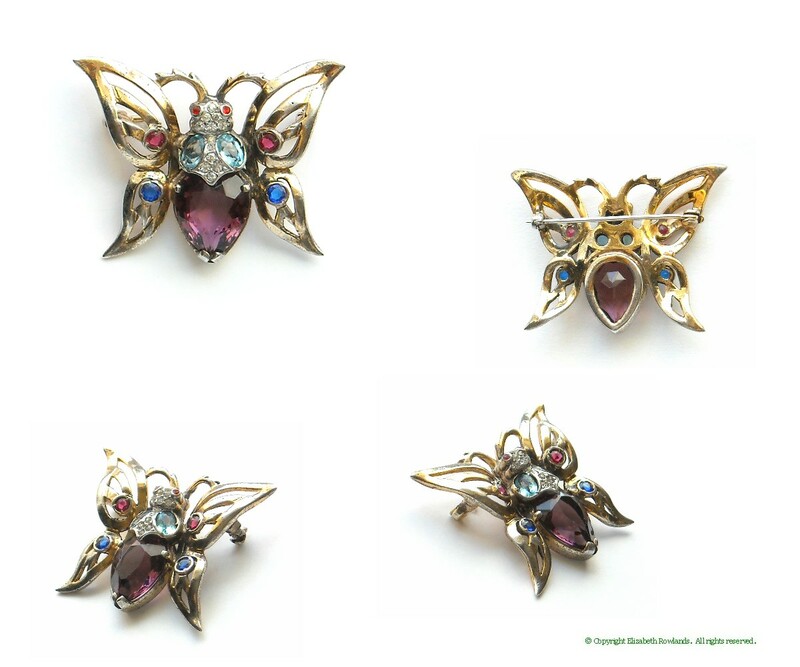 Exceptional condition; ca. 1948. 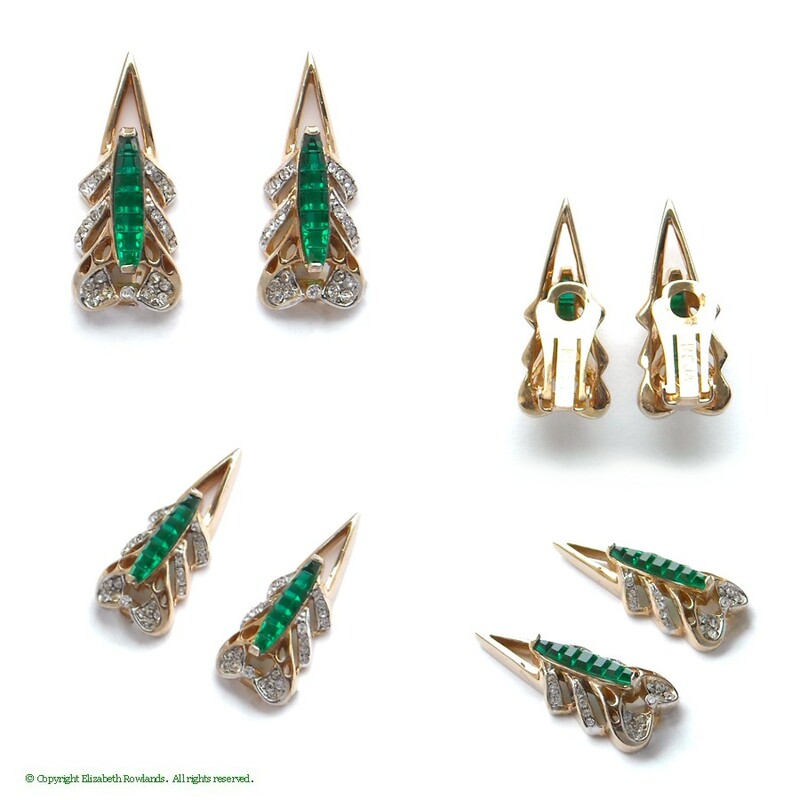 Marked: Reja Inc.
Brooch: 1¾ by 1⅛"; Earrings: 1⅛ by ¾"
Necklace: 14", 1¼" drop; Earrings: 1¼" diam. 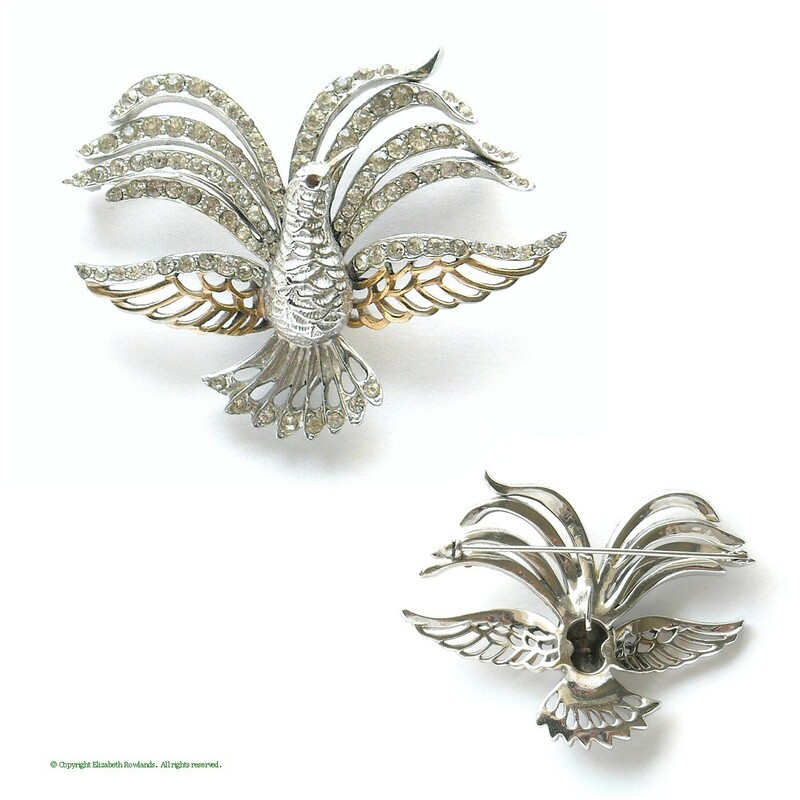 Reference: Click here to see the 1946 ad for similar pieces. 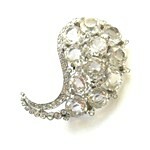 The large unfoiled crystal rhinestones in this paisley shaped brooch give it great pizzazz. 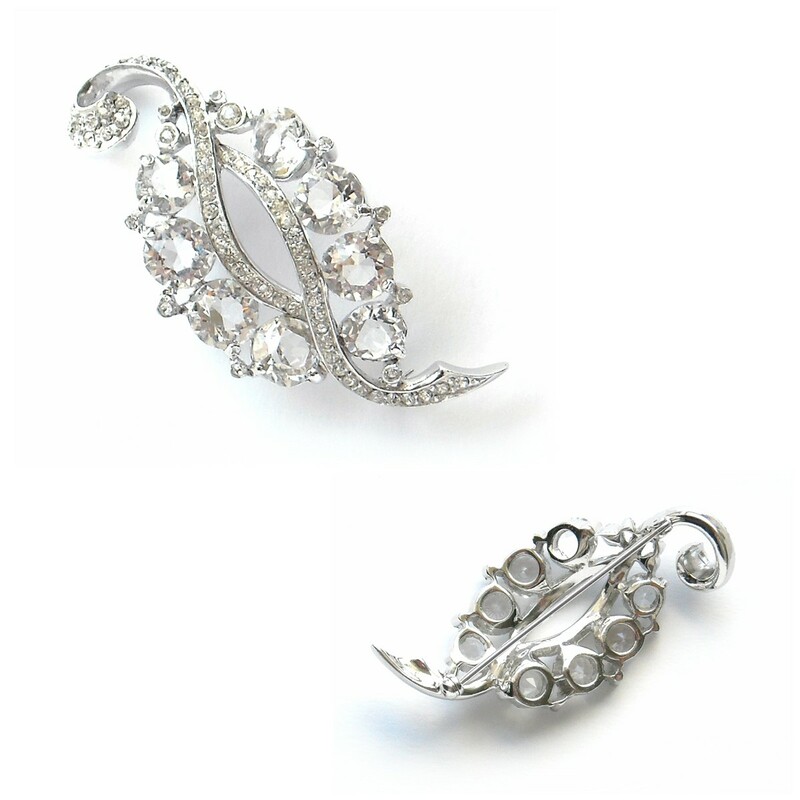 The edging of smaller stones add delicacy for a stunning piece. Exceptional condition. Unmarked, but unmistakably Reja. 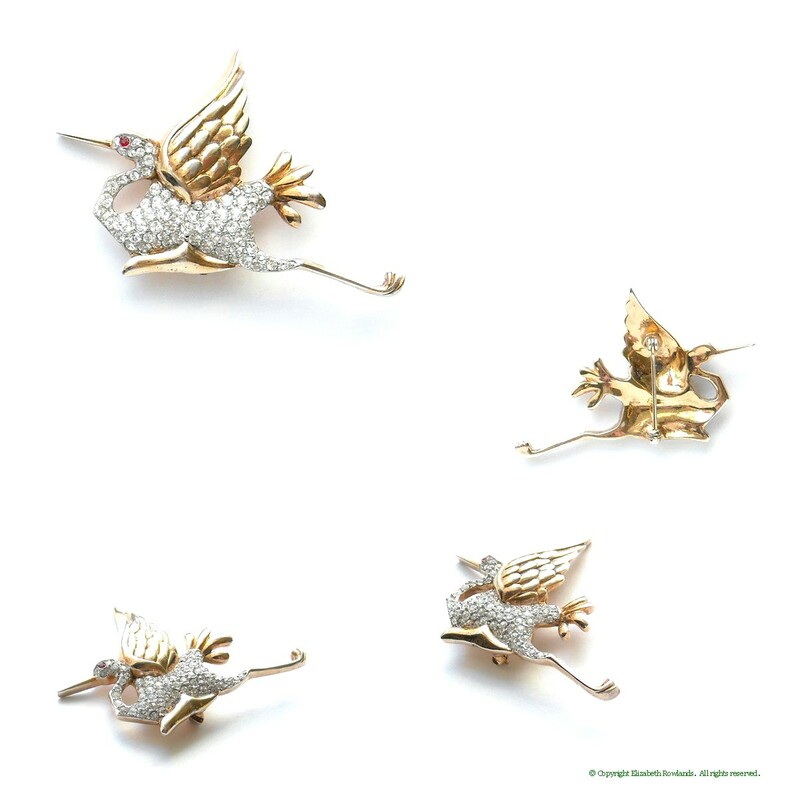 Gracefully winging its way, this lovely heron is detailed and sparkling with rhinestones. 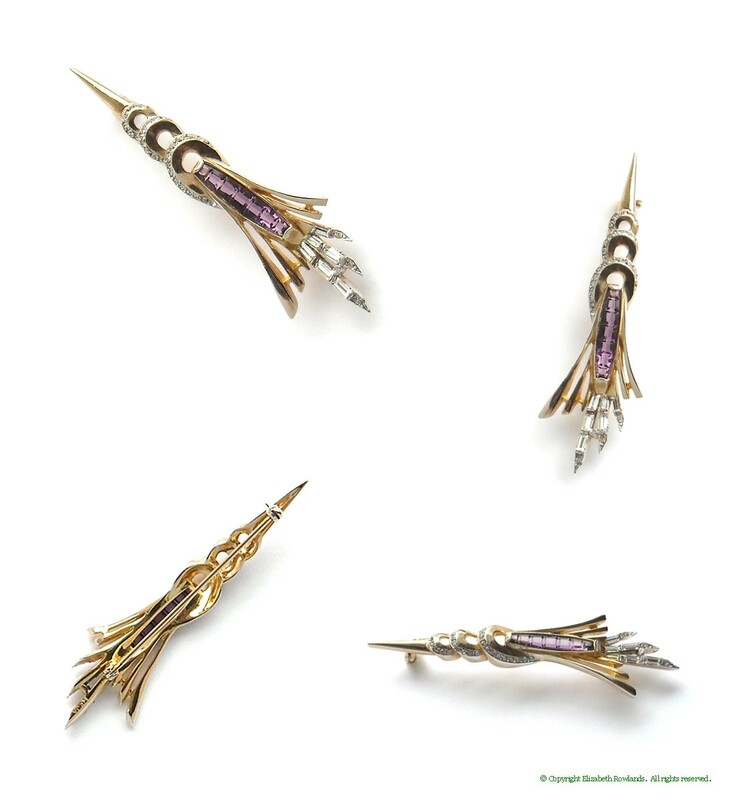 Although unsigned, attribution to Reja is made from similar designs as well as the quality and construction of this lovely piece. Ca. 1940s. 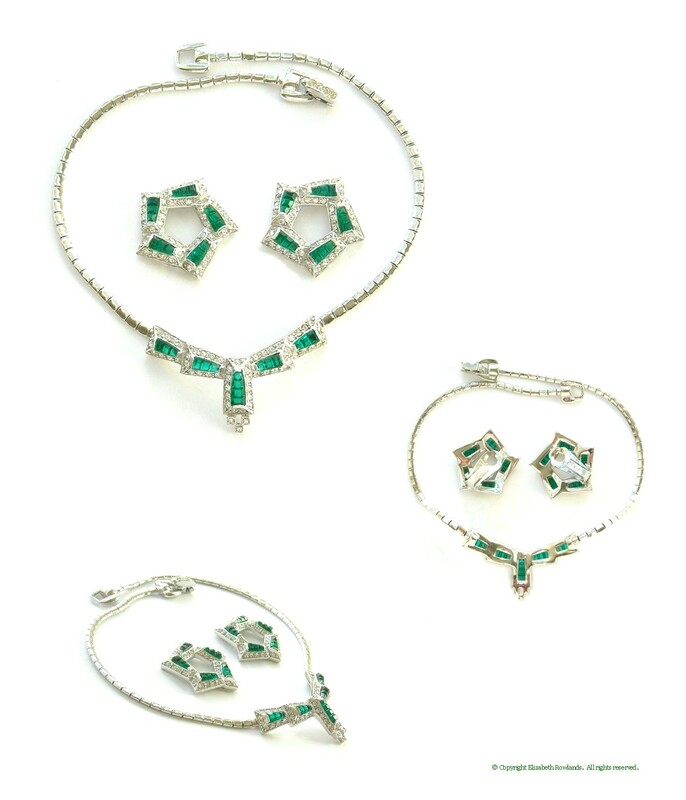 Although unsigned, this delightful set has the style and complex construction of Reja pieces. 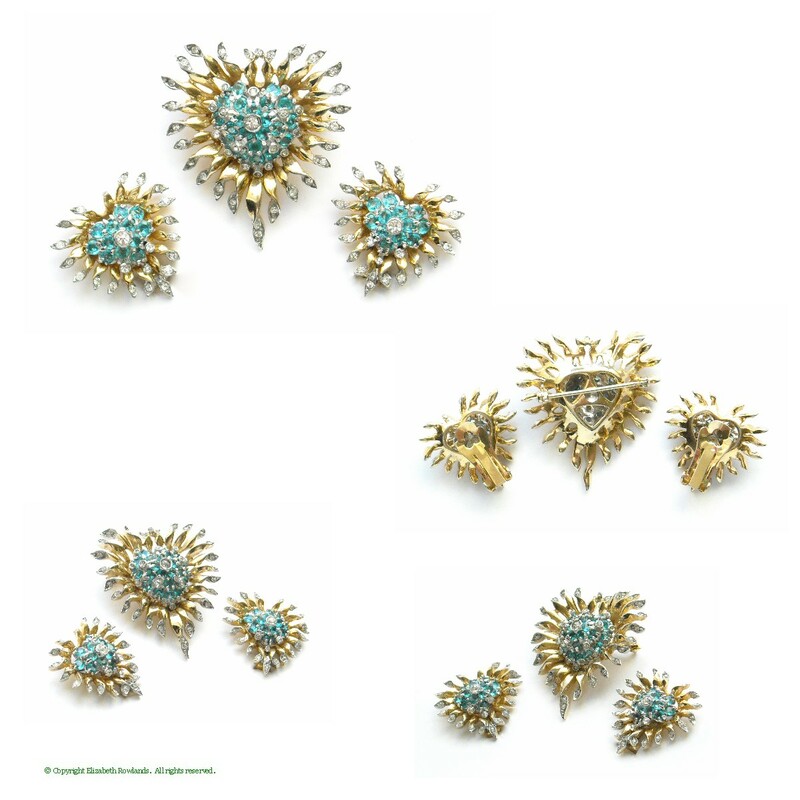 The stylized domed heart centers have unfoiled, open-backed aqua stones and end in a radiating fringe. 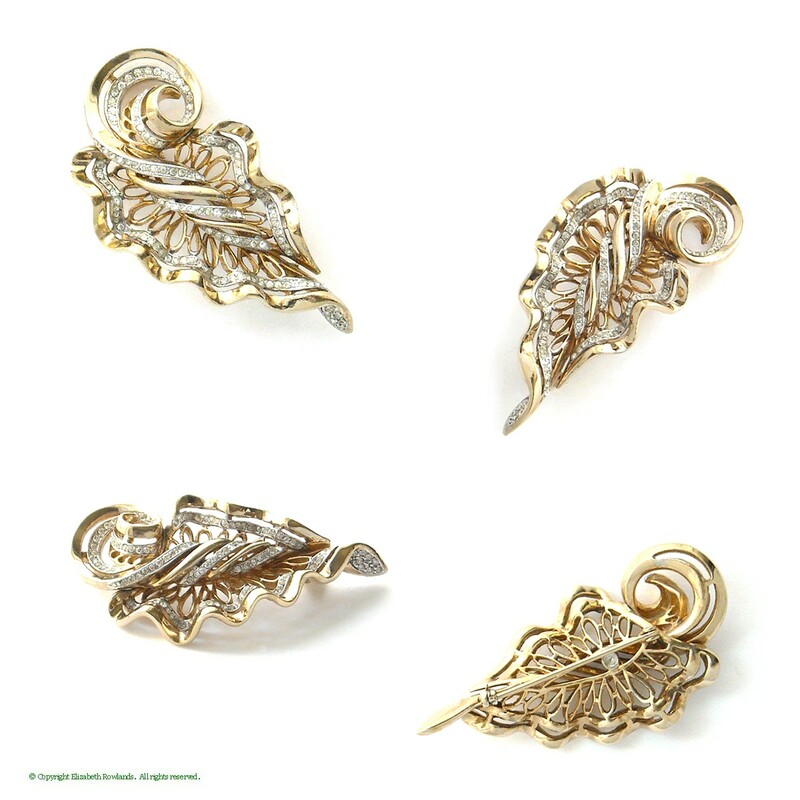 Settings incorporate both gold and rhodium plating and the set is in exceptional condition. 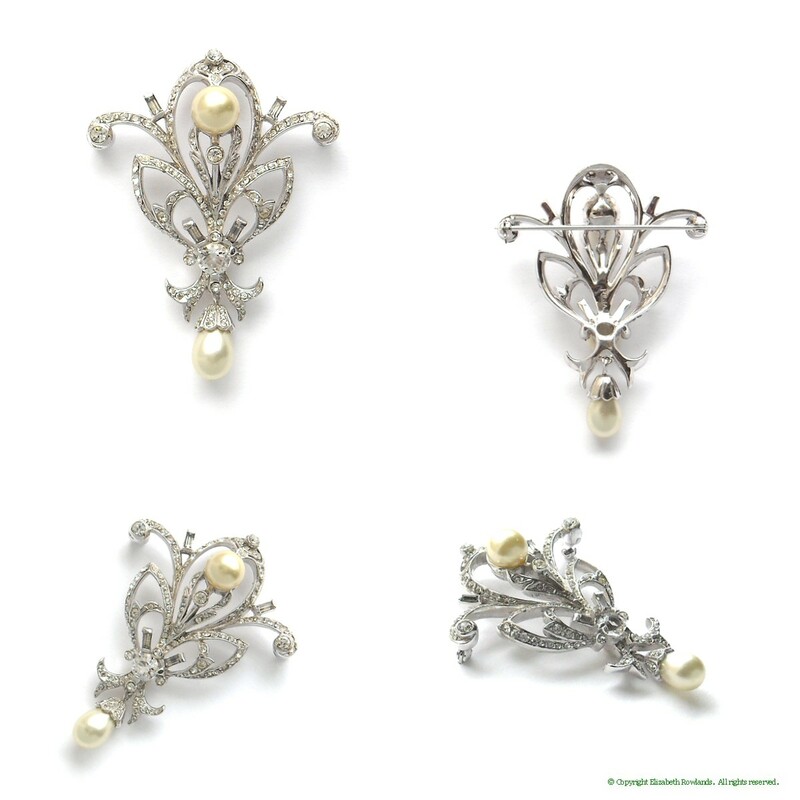 Earrings are clip style. 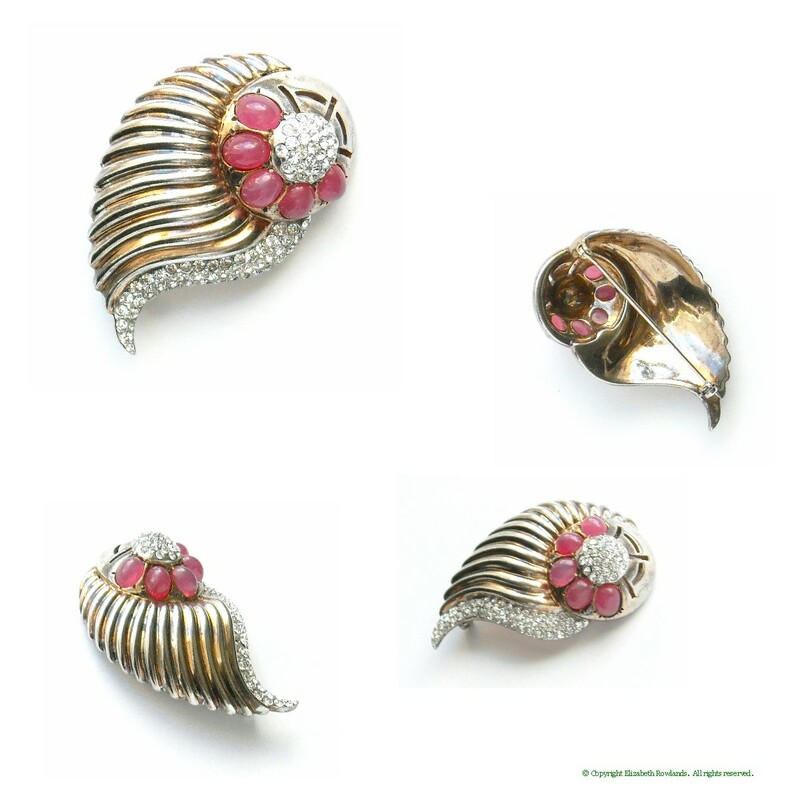 Brooch: 1¾ by 1¾"; Earrings: 1⅛ by 1"
Luscious large ruby octagon stones adorn the center of this arrow brooch. 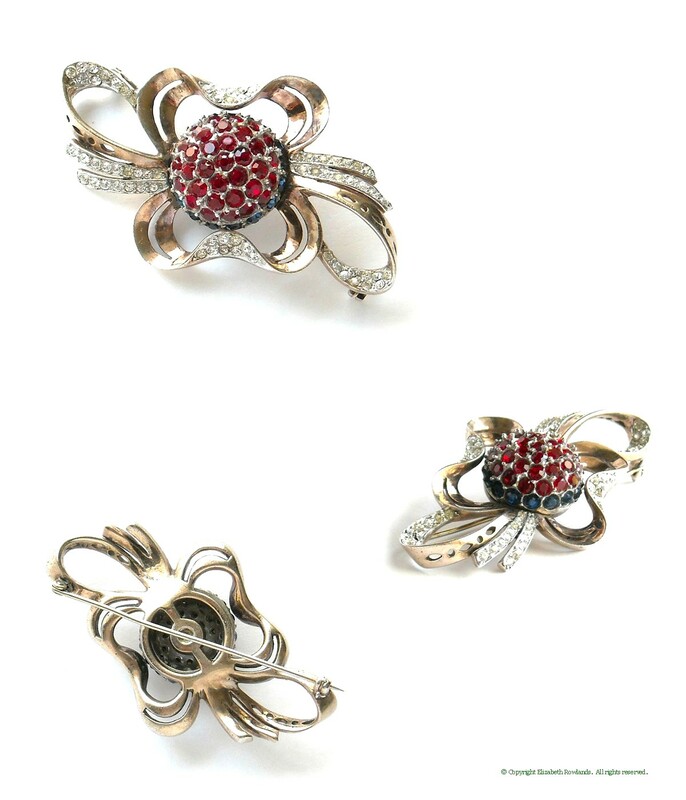 The setting is sterling with a rose gold plating and pavé rhinestone details. 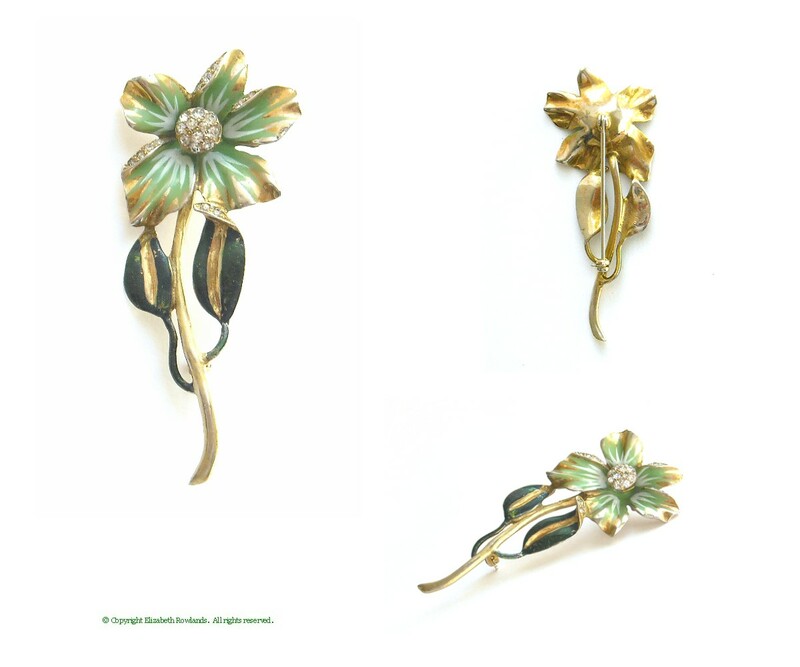 Like many other Reja pieces, this brooch is not marked as such, but is pictured in reference books. Marked: Sterling. 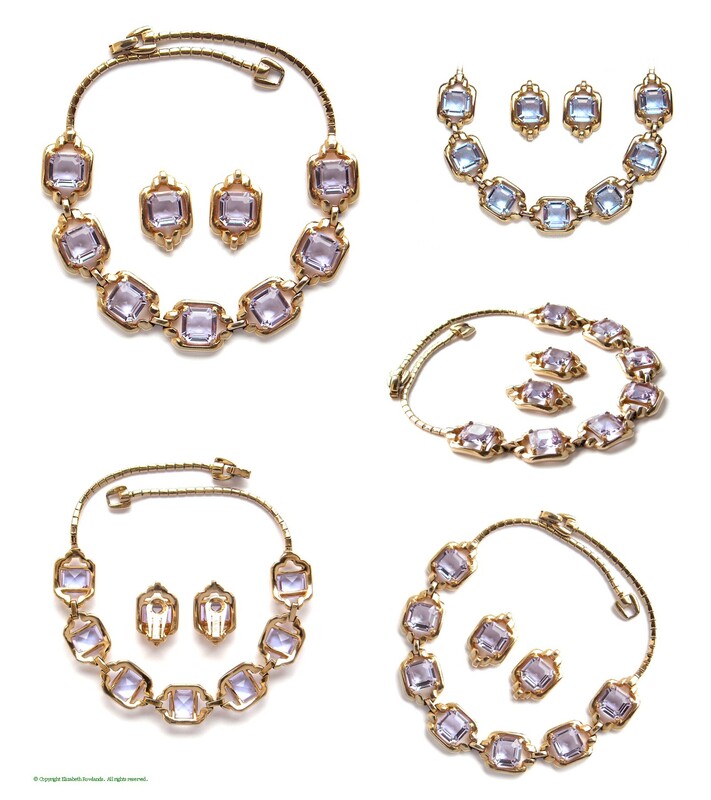 Reference: Brunialtis' American Costume Jewelry, p. 208. 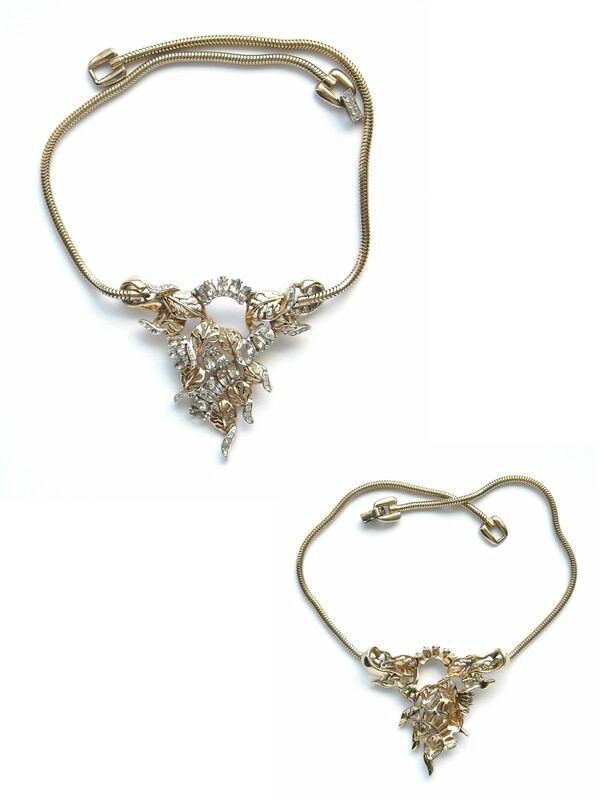 From the late 1940s, this lovely choker has an airy swirling design, enhanced with rhinestones and large faux pearls. 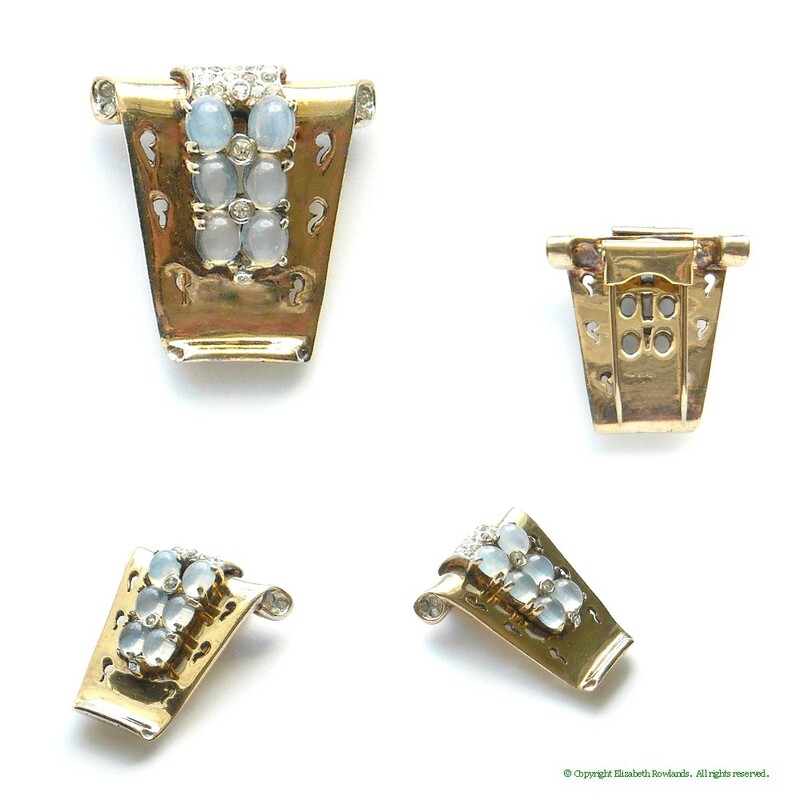 The use of both silvertone and goldtone finishes add to the mystique. Condition is excellent. 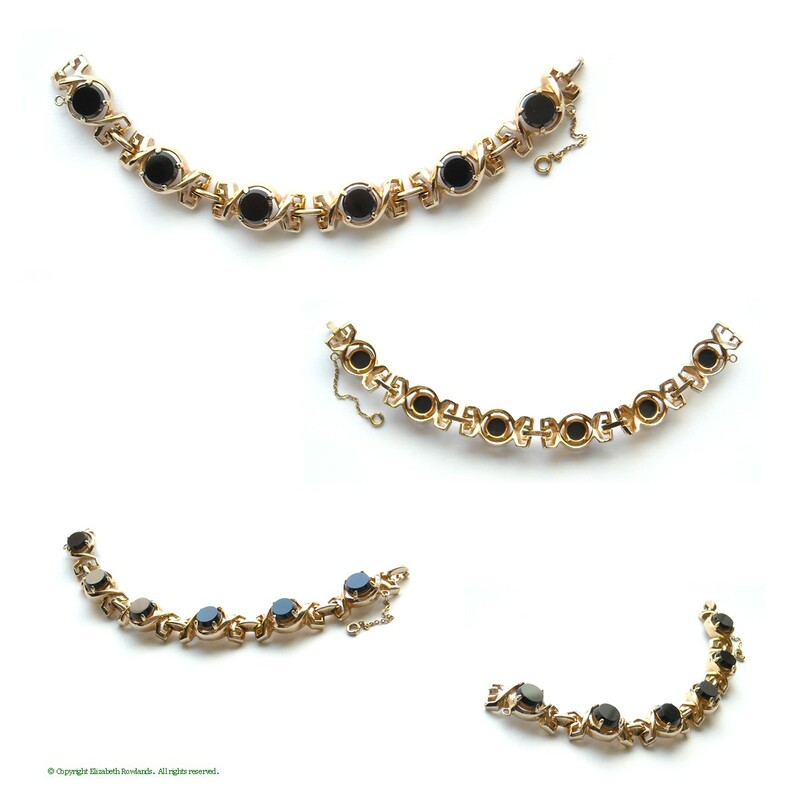 Note: the chain is goldtone, though it appears more silver in color in the image. 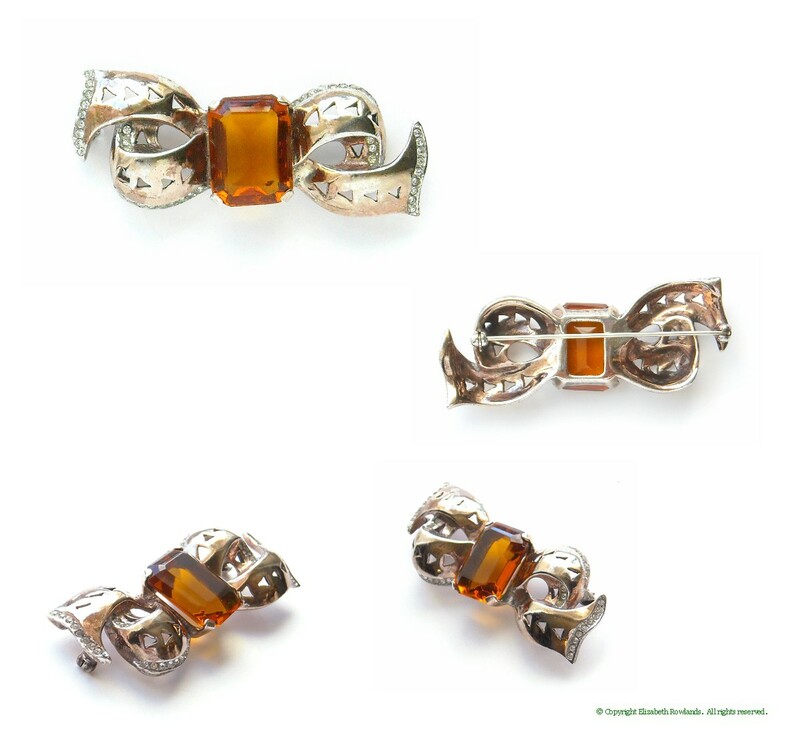 Unmarked but with characteristic style and construction of Reja pieces. 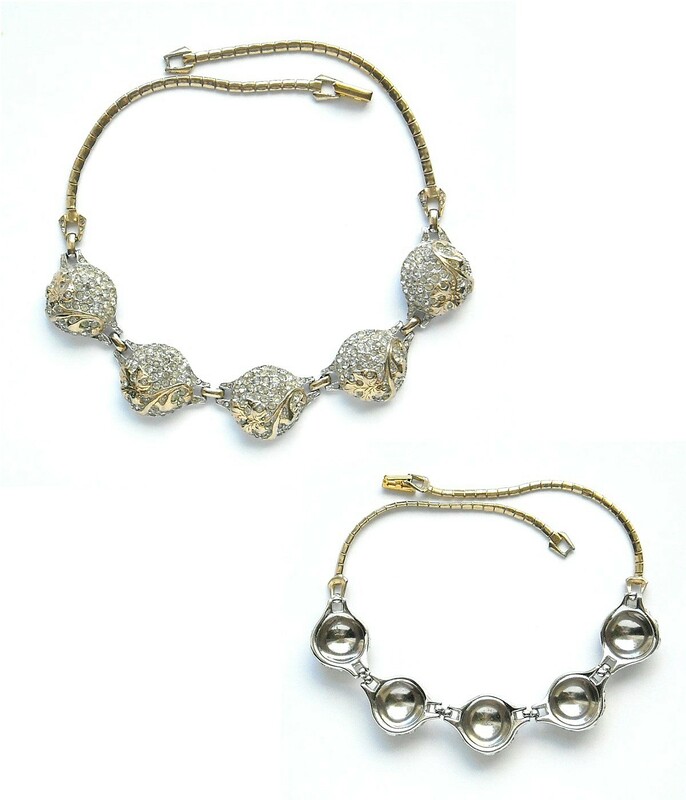 See item SR011 for a very similar necklace. Reference: click here for the 1946 ad for other pieces in this series. 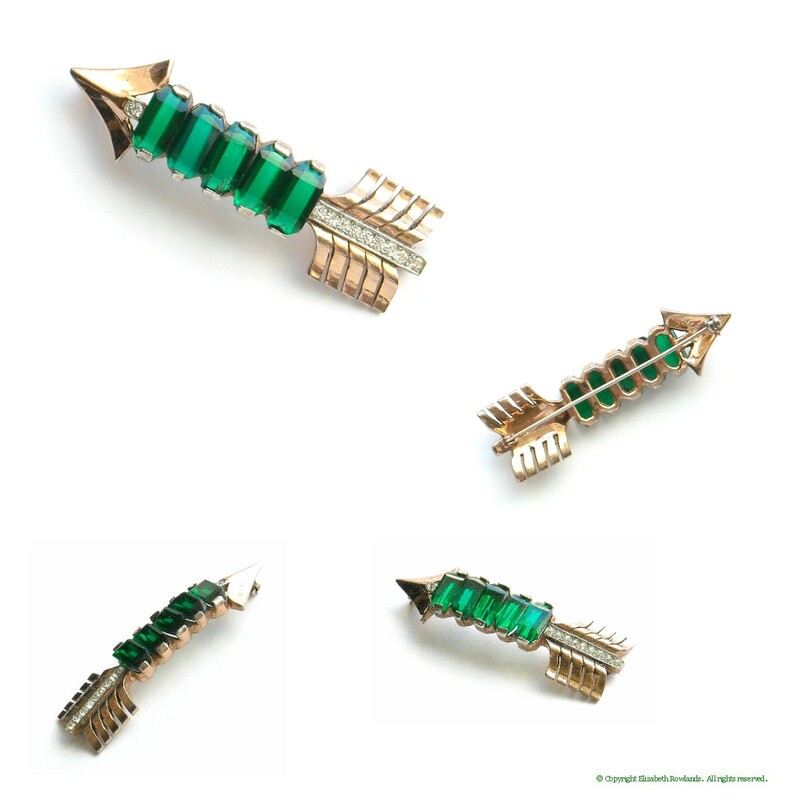 Brooch: 2¼ by 1¾"; Earrings: 1 by ¾"
Striking large emerald cut green stones create the center of this lovely arrow brooch. 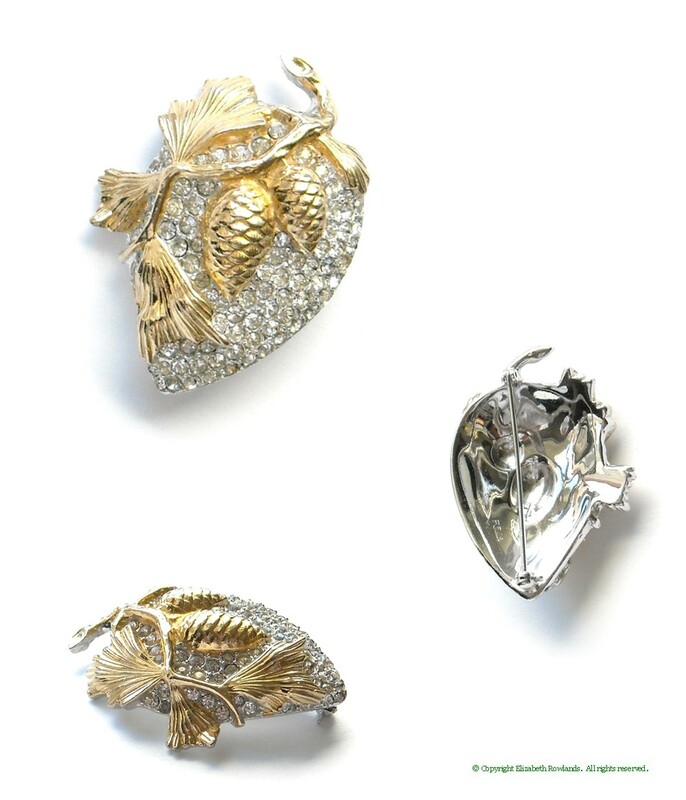 The setting is sterling with a rose gold plating and pavé rhinestone details. 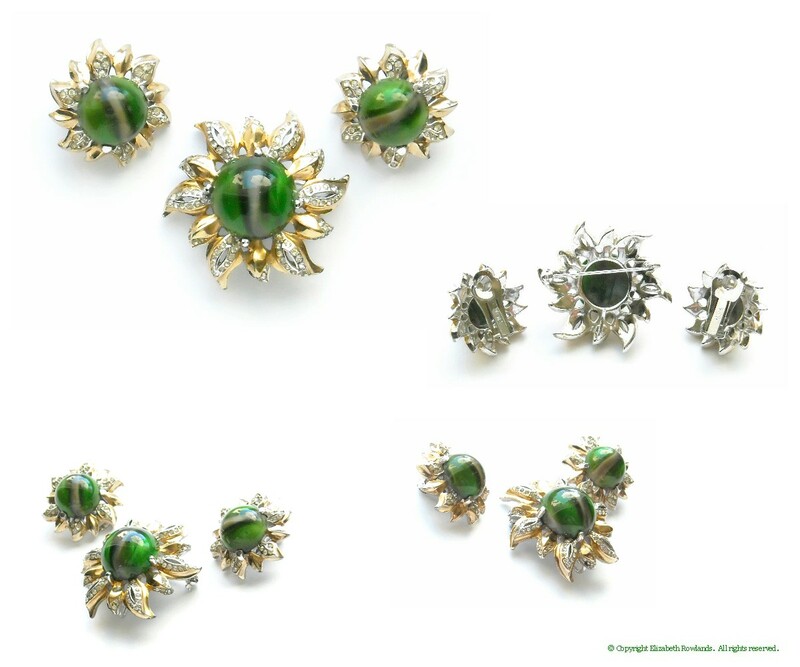 Note: one of the green stones is chipped on the corner — not noticeable when worn, but this is reflected in the price. 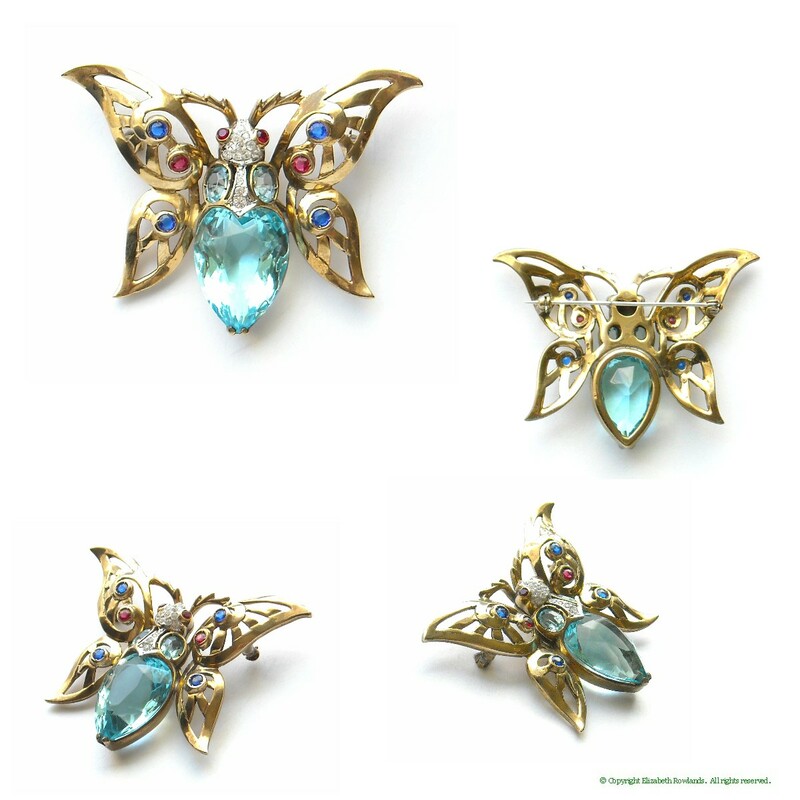 Like many Reja pieces, this brooch is not marked. Marked: Sterling. 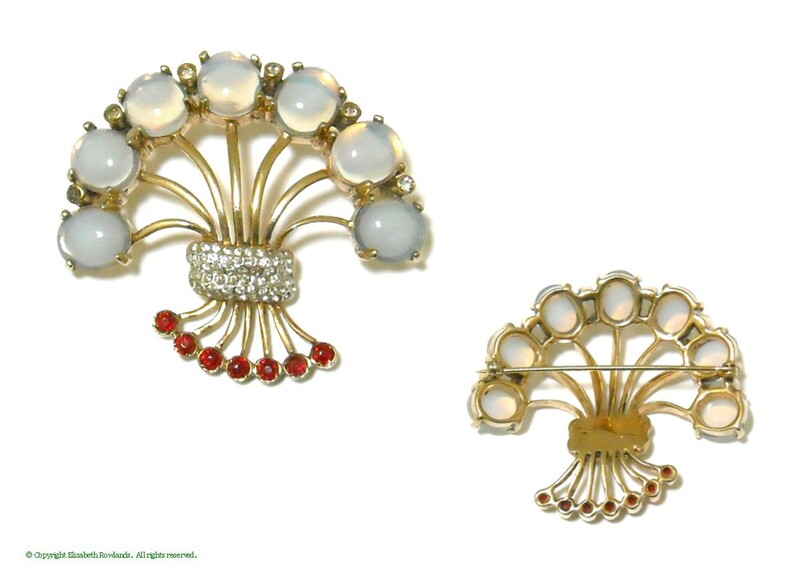 Reference: Click here to see the 1946 ad for this design in "rose opal" cabs. 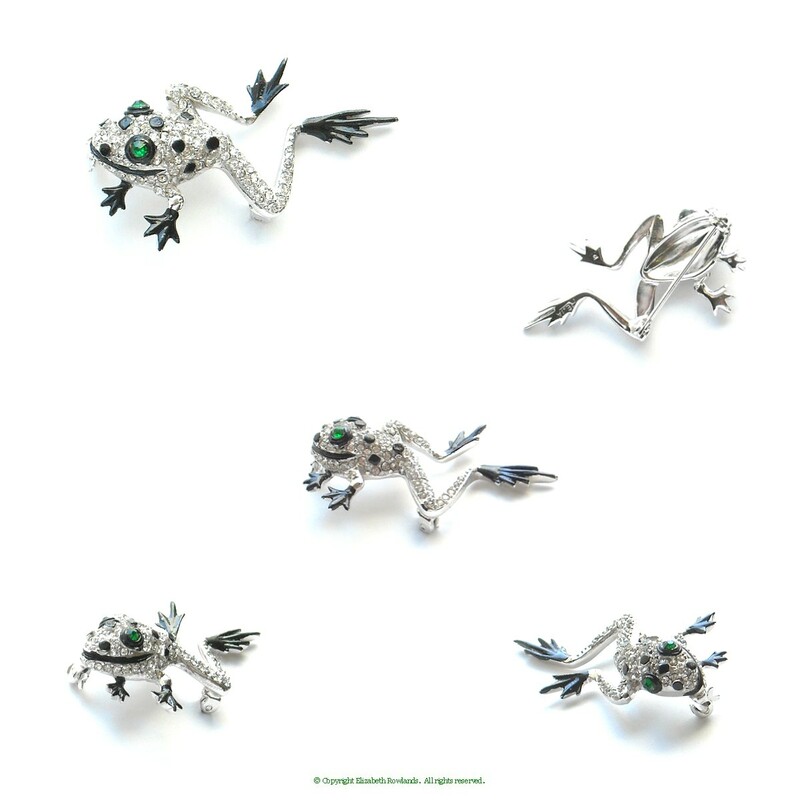 Brooch: 2¼ by 1¾"; Earrings: 1¼ by 1"
Alluring and fluid, this rhodium plated brooch has large unfoiled, open backed stones and pavé accents. 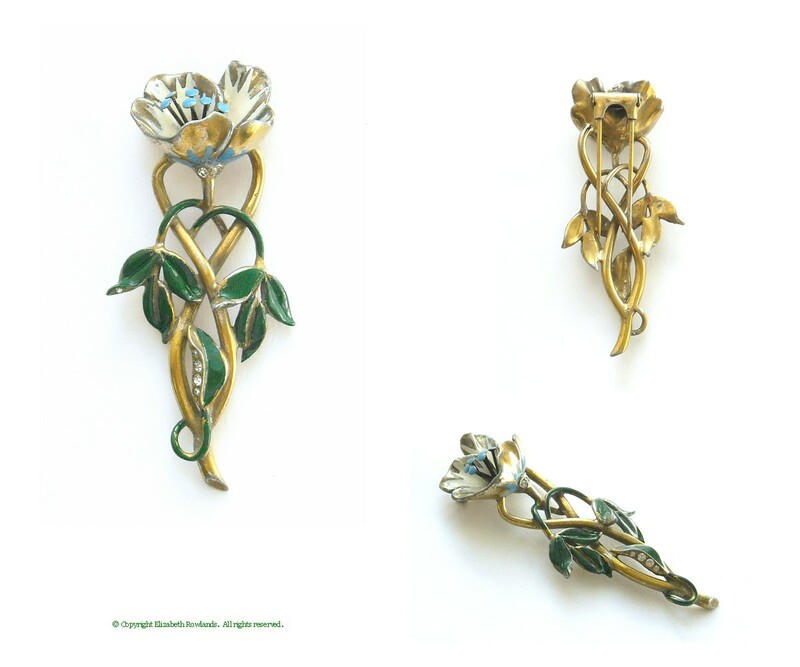 What a perfect example of Reja quality and design. Marked: Reja Inc.
Lively and dimensional, this bird seems to be dancing rather than flying. 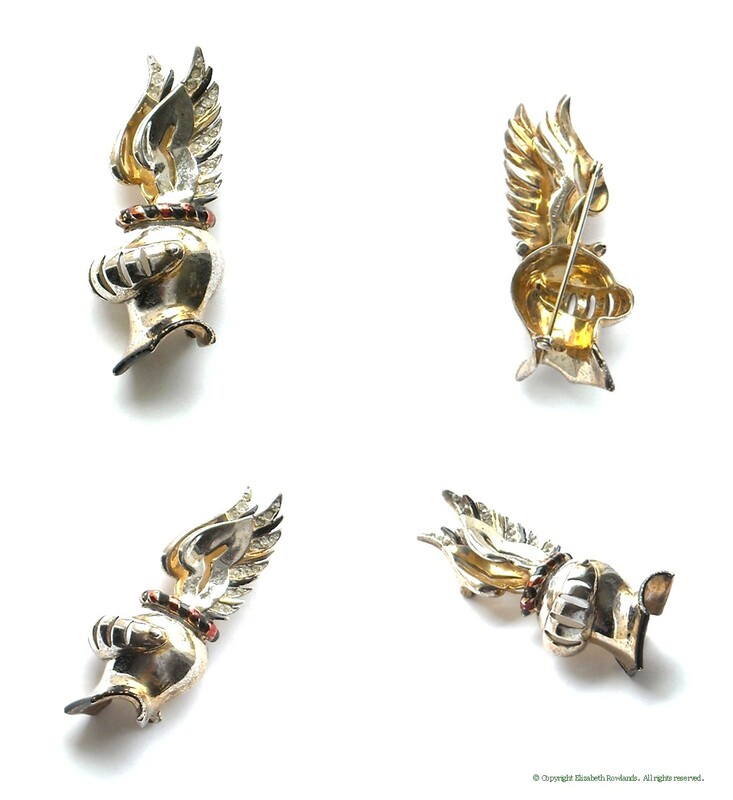 Although unsigned, experience and intuition indicate that this is a Reja piece, and a similar signed snail figural is on the market. 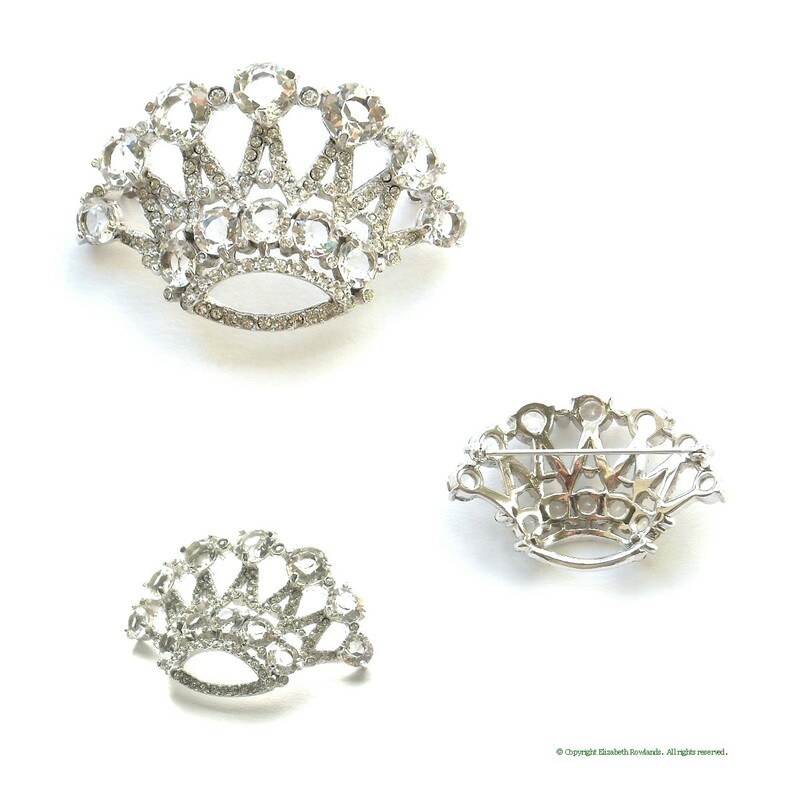 The setting is rhodium plated with goldtone accents and this beauty also has a pendant loop. 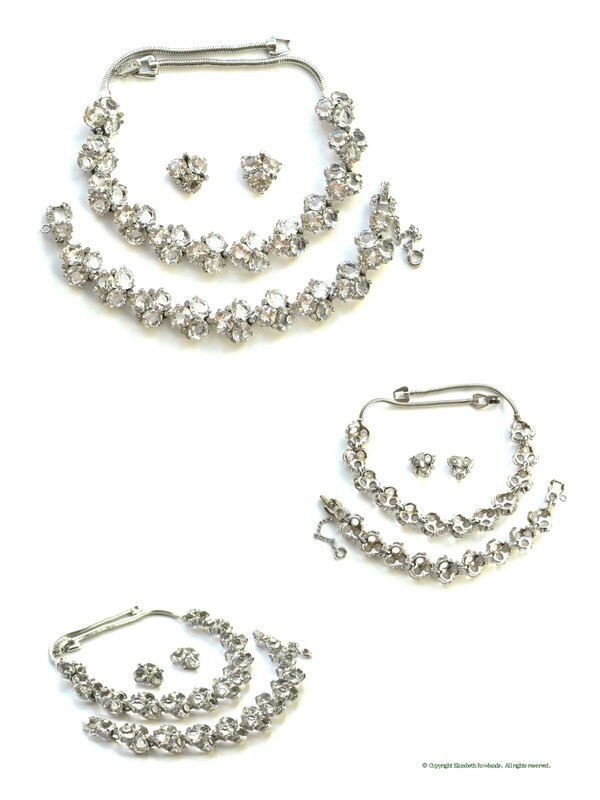 Necklace: 15¼", Bracelet: 7", Earrings: 1¼ by ⅞"
Each is 1⅝ by ⅝"
Brooch:1⅝" diam. 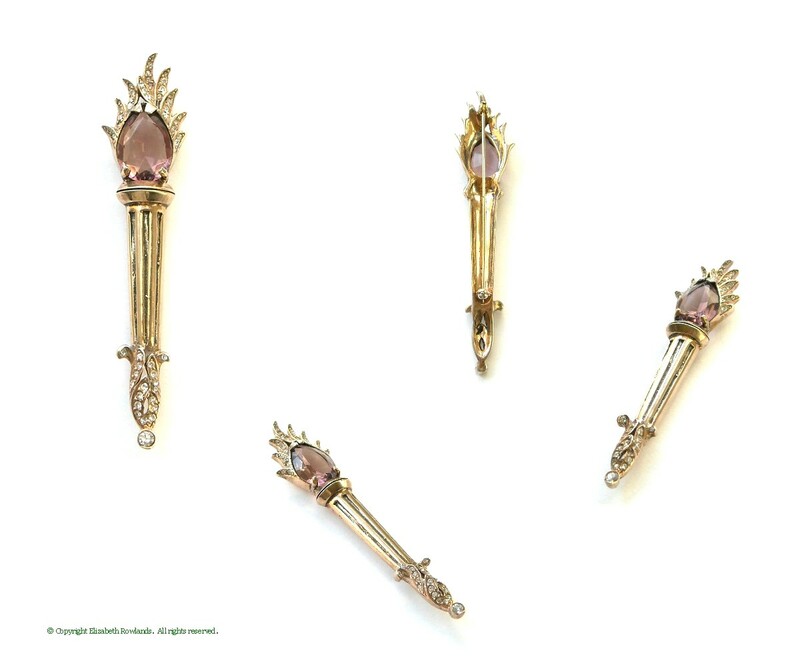 ; Earrings: 1" diam.